After a fabulous start to kick off the new year, for our January event, we seriously can’t wait for this one and we hope you can join us at this one. For this month we are ecstatic to be welcoming Enterrec Label boss Champa to headline and play at one of our events for the first time. You can expect in this set to hear his own Original Psy Trance productions, along with Remix’s of his which he has done for many top Psy Trance Artists. With his birthday also landing a few days after this event, his debut appearance adds something else very much extra special. 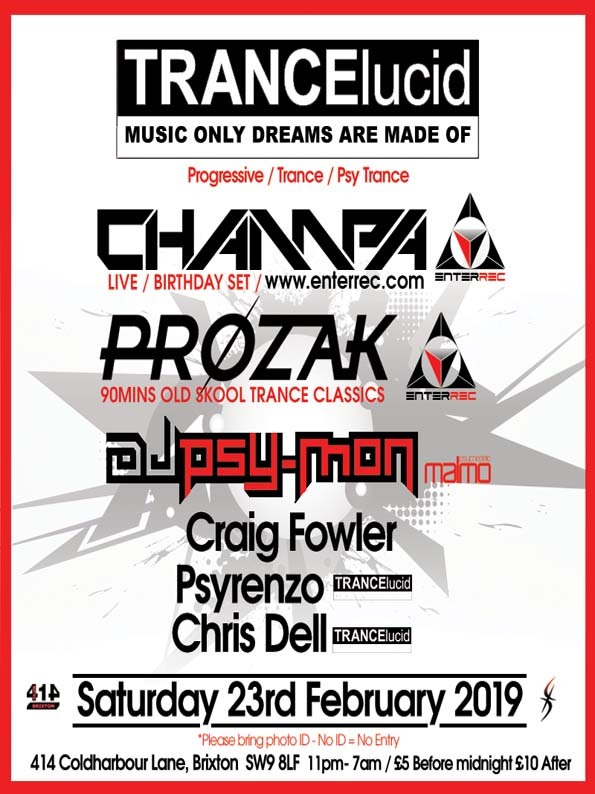 He shall also be playing a very special 90 minute old skool Trance Classics set (on vinyl), under his other guise and Prozak, where he shall be digging out over the coming weeks his favourite tunes from back in the day. from now and leading up until the day. £5 before midnight / £10 after. PLEASE BRING PHOTO ID / NO ID NO ENTRY.